Renal echinococcosis, also called the hydatid cyst of the kidney, is a very rare condition caused by the parasite Echinococcus. Kidney is the third commonest organ involved after the liver and the lungs. The incidence of renal involvement is about 2% of all hydatid disease in man and isolated renal involvement is very rare. It is endemic in parts of Eastern Europe, Middle East, South America, Australia, New Zealand, Alaska and Canada. A 30-year-old female patient presented with vague abdominal pain of 1 year duration, insidious in onset, non-progressive and dull aching in type. There were no other symptoms associated with the pain. General physical examination revealed no abnormality and systemic examination revealed a lump in the right hypo-chondrium. Routine blood examinations were normal. The X-ray of the abdomen and chest were reported normal. Ultrasonography of the abdomen picked up a cyst in the upper pole of the right kidney, measuring 20 cm in the largest dimension. Rest of the urinary system was normal. A computed tomography (CT) scan [Figure 1] of the abdomen was done and displayed a cyst at the upper pole of the right kidney. There were no similar lesions in other abdominal viscera. A diagnosis of isolated renal echinococcosis was made on the basis of presence of a few daughter cysts at the bottom. Figure 1: CT scan of patient showing the hydatid cyst in the upper pole of the right kidney. The patient was approached laparoscopically and the diagnosis of a hydatid cyst involving the upper pole of the right kidney was confirmed. The cyst was separate from liver and gall-bladder [Figure 2] and was not in communication with the renal tubular system. The endocyst was removed after sucking the inner hydatid fluid and instilling hypertonic saline followed by reaspiration. Subsequently, omen topaxy was done and the patient was put on a course of oral albendazole therapy, given at a dose of 10 mg/kg for 21 days for three cycles with an intervening period of two weeks between the cycles. Histopathology confirmed the diagnosis of hydatid cyst. Postoperative follow-up of the patient for three months by ultrasonography of the abdomen showed the patient to be disease free. Figure 2: Mass separate from liver and gallbladder. Renal echinococcosis, also called hydatid cyst of the kidney, is an acquired disease of the kidney, caused by the parasite Echinococcus. Renal echinococcosis comprises about 2% of all hydatid diseases in man. Two variants of the disease occur: classic hydatid disease caused by Echinococcus granulosus and the rarer  multilocular variant caused by Echinococcus multi-locularis, which is more aggressive because it infiltrates the organ involved and hence cannot be easily removed. Echinococcus, also called the flat worm, belongs to the order cestoda and the family taenia. It is about 5 mm long and the adult resides in the large bowel of foxes and dogs in case of E. granulosus and small rodents in case of E. multilocularis. Man is the intermediate host and gets the disease by ingesting vegetables and water contaminated by the eggs excreted by the affected animals. The embryos hatch in the duodenum and migrate into the small bowel wall to enter the mesenteric circulation and are filtered in the liver or the lungs or the kidney, where the embryo becomes a small vesicle with an inner germinal epithelium called the lamellated membrane that produces secondary or daughter brood cysts containing scolices. The brood cysts float freely in the hydatid fluid and are called hydatid sand. The cyst is slow growing and many years may elapse before a significant size is reached. The surrounding parenchyma gets thickened to form a pericyst. 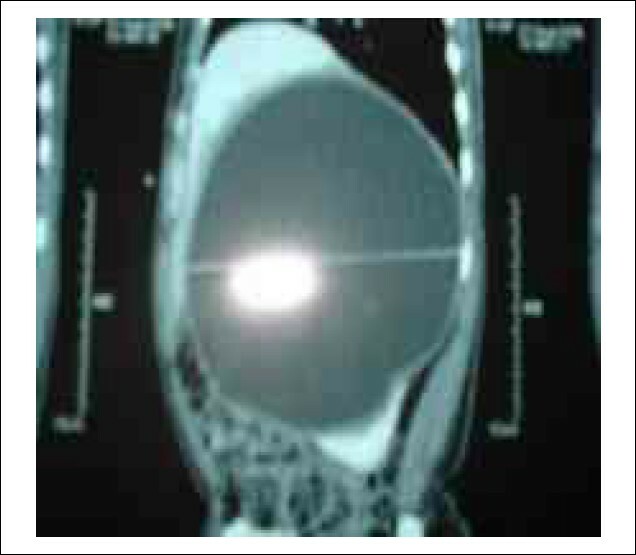 Management is mainly surgical, in view of the catastrophic complications that a cyst rupture can cause. Conservative medical management with oral albendazole is unreliable, being successful in only 40% of cases. Radiological intervention in the form of Percutaneous Aspiration Injection Re-aspiration followed by Percutaneous drainage (PAIR-PD)  has been described,  but is again is successful in only 70% of cases of unilocular cysts. Hence, surgery is the main form of treatment, especially so for the multilocular variant of the disease for which surgery is the only form of treatment. Surgical management consists of various options. Total excision consists of either wedge resection or partial nephrectomy and partial excision includes partial pericystectomy followed by capitonnage, re-approximation of the pericyst or marsupialization. Renal sparing surgery by way of partial excision is possible in 75% cases  and is the most adapted treatment whenever possible. Partial excision should be preceded by the injection of scolicidal agents into the cyst which include 20% hypertonic saline, chlorhexidine, 80% ethanol, 0.5% cetrimide, 3% H 2 O 2 and 0.5% silver nitrate. Patient has to be operated under the cover of antihistaminics and steroids for the fear of anaphylaxis if cyst rupture occurs during surgery. No intervention is needed when the cyst walls are calcified. Conventionally, it is recommended to start the patient on a course of oral albendazole after surgery. 1. Ameur A, Lezrek M, Boumdin H, et al. Hydatid cyst of the kidney based on the series of 34 cases. Prog Urol 2002;12:409-14. 2. Turker Koksal I, Tefekli A, Kilicaslan I, Erdemir F, Kadioðlu T, Esen T. Hydatid disease of the kidney caused by Echinococcus multilocularis: A rare clinical entity. Urol Int 2001;67:310-2. 3. Gogus C, Safak M, Baltaci S, Turkolmez K. Isolated renal hydatidosis: Experience with 20 cases. J Urol 2003;169:186-9. 4. Vargas-Serrano B, Ferreiro-Arguelles C, Rodriguez-Romero R, Marcos del Rio N. Imaging findings in renal hydatid disease. Eur Radiol 1997;7:548-51. 5. Angulo JC, Sanchez-Chapado M, Diego A, Escribano J, Tamayo JC, Martin L. Renal echinococcosis: Clinical study of 34 cases. J Urol 1997;157:787-94. 6. Cushieri SA, Steele RJ, Moosa AR. Treatment of Hydatid Cyst, Essential Surgical Practice, 4th ed. Arnold Publishers, Oxford. Butterworth-Heineann;2000;350. 7. Akhan O, Ustunsoz B, Somuncu I, et al. Percutaneous renal hydatid cyst treatment: Long-term results. Abdom Imaging 1998;23: 209-13. 8. Zmerli S, Ayed M, Horchani A, Chami I, El Ouakdi M, Ben Slama MR. Hydatid cyst of the kidney: diagnosis and treatment World J Surg 2001;25:68-74. 9. Horchani A, Nouira Y, Kbaier I, Attyaoui F, Zribi AS. Hydatid cyst of the kidney. A report of 147 controlled cases. Eur Urol 2000;38:461-7.